I have been in the green and pleasant land, where it was cold, damp and on the very last day also snowy. Not a lot of green to be seen, the sheep in the field difficult to see, their long, winter- yellowing fleeces matching exactly the straggly grass. On the first and only warmer sunny day of my visit I worked with my Dad in the garden, which is the nicest place for us to be together, busy and feeling near to my mum. 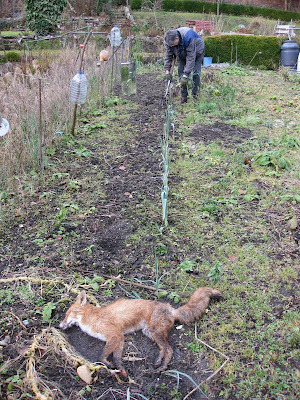 Our first job was rather unusual: we had to bury a fox that lay with it long, fluffy brush stretched out behind him at the end of a row of leeks. I spotted him, as I had gone to dig up the leeks for our lunchtime soup! It is always sad to see dead animals, especially when they have suffered as this one had. It had been hit on the road and struggled over high walls into the safety of our garden. On the other hand, it is always a wonderful opportunity to get such a close-up view of nature, which is usually denied us. This fox was small and neat and trim, and such a beautiful colour, many shades of rusty brown and sandy beiges. He had extremely long incisor teeth. and was unfortunately not as quick and sly as they are usually renowned for being, as a car got him on the busy main road. My job in the garden was to clear the broken flower stems and clear a few of the dead leaves away so we could enjoy the snowdrops that were slowly appearing. Luckily I sensed that it may just be a bit too early for this and left just enough debris to protect them under the snow that arrived in Norfolk shortly before I left on Sunday. My dad had written himself a note of things to show me in the garden and at the bottom it said 'f'rog'. I have been a frog fan since childhood, always finding one to play with, and this wasn’t the first time that my Dad had something new and froggy to show me. But this was a first! 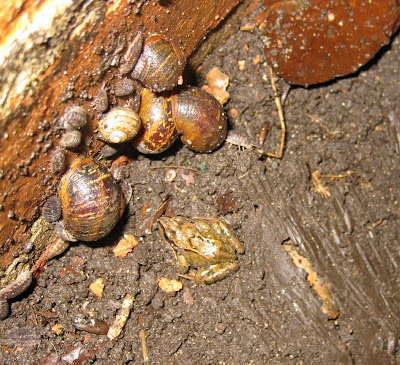 The second picture above shows the tiniest, best-camouflaged hibernating frog one can imagine. Dad had discovered it under a bag of compost that he had wanted to use. Needless to say the compost remains in its place until the spring has sprung, and the frog with it. As the sun went down the cold dampness returned and we went inside to enjoy the warmth of our home-grown leek-and-potato soup. The quick brown fox jumps over the lazy dog – this is a pangram using all the letters of the alphabet. It is a sentence used to test typewriter and computer keyboards since the late 1880s. Brush - a fox's tail, hence Brazil Brush one of my favourite children's TV programmes.